There is a country where ice sports are immensely popular – Russia. In Kusk, they have a Mega Green shopping mall that opened 2016. In the centre of the shopping mall is an entertainment area. During the winter is it converted into an 1800m2 ice rink where nearly 300 people will ice skating at the same time. When the winter has passed, the ice is substituted and carting starts working within the space of the ice rink. 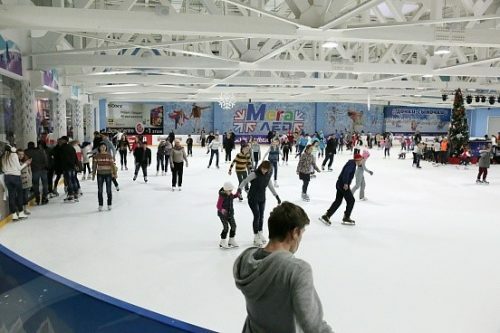 In order to make sure that the shopping mall will stay in good condition and not be effected by the moisture from the ice rink and the surroundings. The moisture and supply of fresh air is controlled by a Seibu Giken DST dehumidifier. Without dehumidification in this entertainment area, moisture would form creating numerous maintenance and safety issues. That’s because the ice works like a cooling plate in the warm air in the shopping mall and when warm and cool air mix condensation forms. The condensation can make the floors slippery and contribute to rust on metal and mould on textile. In order to avoid these problems, Gigroterm installed two DST CZ-102HWR dehumidifiers, with the possibility to post cool and heat the air. The dehumidifiers control both dew point and relative humidity in the arena so that condensation does not form on the cold surfaces. Now the relative humidity does not become too high which ensures that the building is protected from corrosion, mold and decay. With the installed dehumidifiers, Mega Green gets both the climate they want, while being energy efficient as they do not run unnecessarily. The dehumidifiers primarily use surplus heat from the cooling machines, which makes the system very energy efficient. Since Gigroterm installed the dehumidifiers at Mega Green mall there haven’t been any problems with moisture and they are very pleased with how everything works.